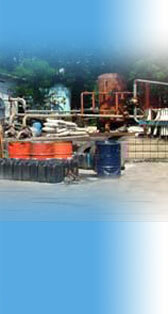 The company has full fledged Effluent treatment plant. It has suction system. Dosing section, flocculating section, filter section etc. Filter section is equipped with carbon and sand, which ensures that the treated effluent confirms to MPCB norms. Major quantity of effluents is treated and discharged in the MIDC drainage line. Moreover, the company is a member of Common Effluent Treatment Plant Association where all the Discharged will be re-treated again before disposing. The company has installed proper dust collectors in its boilers to ensure that the air discharged is as per permissible norms. There is a proper sample collecting system, where the air quality is regularly monitored. The company ensure that any solid waste treated by the company is used for land filling etc. at the places allotted by the government authorities.